Gia Rassier and Megan Myrdal had been looking for a way to build on the success of their locally grown produce movement. In 2015, they'd started Ugly Food of the North, an effort to get people buying local produce even it was blemished or oddly shaped. With a year of Ugly Food under their belts, they wanted to get people excited next about sharing food in their communities. Kicking around ideas, they found an answer in an unlikely place — the end of the driveway. 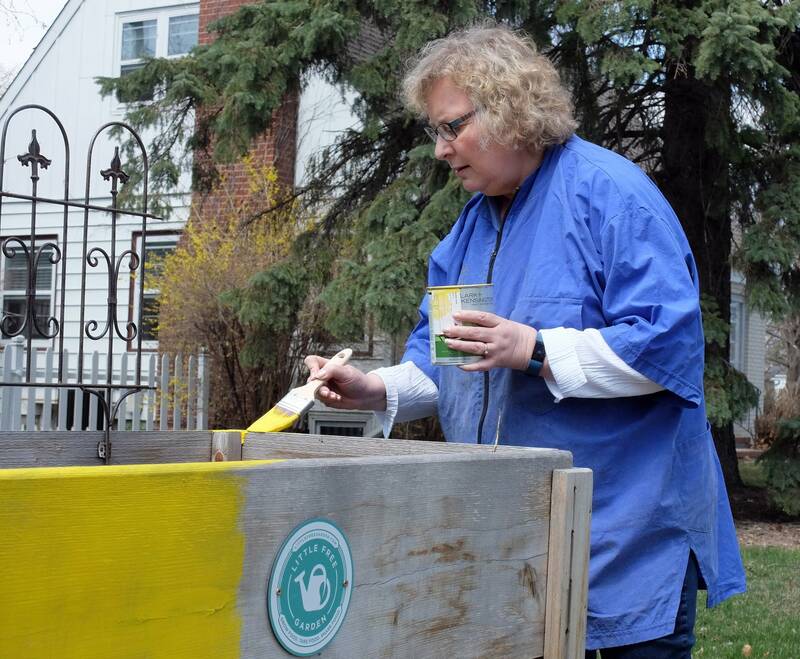 "We were kind of sitting around talking about ways to get people more involved with the growing and sharing of food and we love the Little Free Library idea," Rassier recalled recently. "And we kind of were like, 'What about Little Free Gardens.'" The Little Free Library movement, where people build a small bookshelf in their front yard to share books, began simply in Hudson, Wis., and spread worldwide. Rassier and Myrdal thought they could replicate that same small-is-beautiful vibe with little garden plots by the curb. 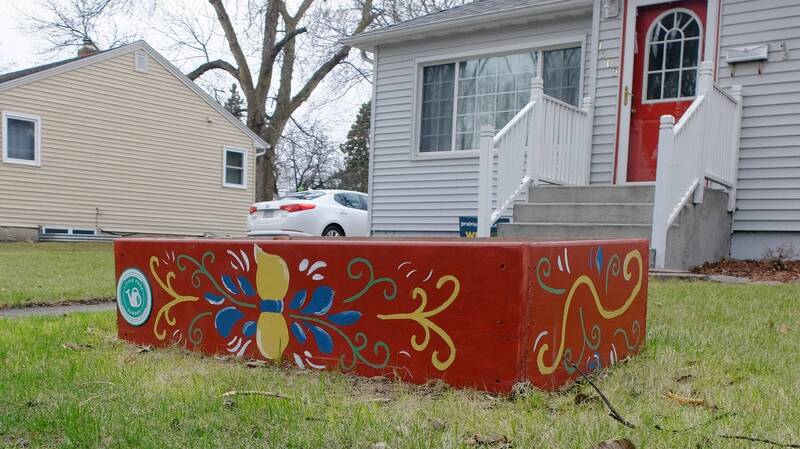 That first spring, a few two-by-four foot wooden boxes popped up in front yards around Fargo-Moorhead, growing cherry tomatoes or peppers or herbs. Now, as the project enters its third growing season, the idea has spread to 10 states and Canada, and there are more than 80 Little Free Gardens in Fargo-Moorhead. Some are just boxes on the ground, others are on legs to deter hungry rabbits. Some people spend hours with a paint brush creating works of art. "I'm a good example of, anybody can do it. We have no gardens," said Moorhead Mayor Del Rae Williams, who admitted she's "pretty tickled" to have Little Free Garden No. 1. She plants cherry tomatoes and sugar snap peas because "they're good snacks to eat as you walk by." The mayor might not claim a green thumb, but she does understand the value of neighborhoods. "And frankly food is one of the key things people gather around, to get to know each other," she said. "So, what better way to share what you have with your community and broader community to get to know each other?" That's exactly what the creators of Little Free Gardens hoped would happen around the small vegetable plots. The tiny gardens aren't going to grow enough to feed a community, but the values they represent offer substantial food for thought, said Myrdal, a co-founder. "This idea that everybody deserves the right to healthy local food, the idea that community matters, knowing your neighbors matters, having conversations in your front yard, those are important things," said Myrdal. This project is a passion for Rassier and Myrdal. Both have jobs. 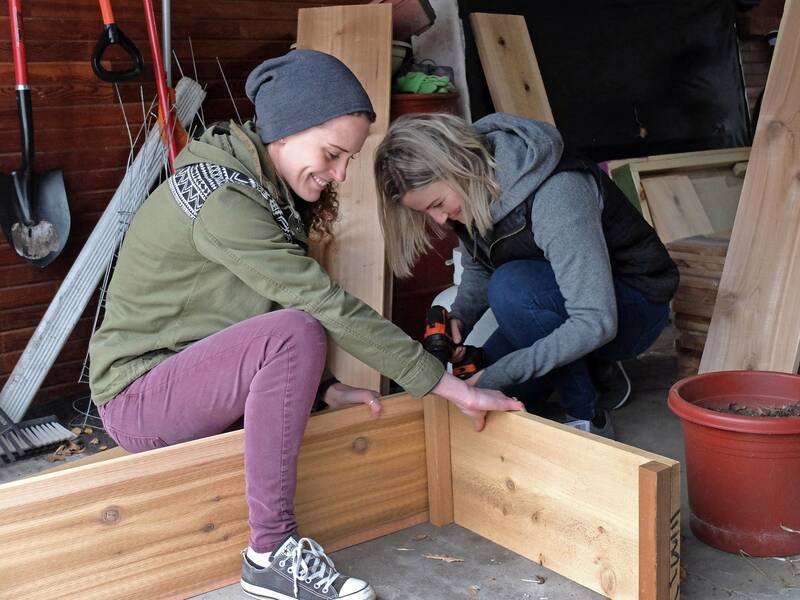 But on evenings and weekends they build garden boxes in Myrdal's garage and deliver them to anyone in the community that buys a Little Free Garden for $65. Some people build larger boxes. "Projects that are born in a community, the community is much more likely to embrace it, so this is truly a Fargo-Moorhead project and the fact that other communities are seeing it and want to bring it to their community that's a beautiful thing and we're super excited about it," said Myrdal. People anywhere can register a Little Free Garden for $25 and get a packet of instructions and a spot on the Little Free Garden map. 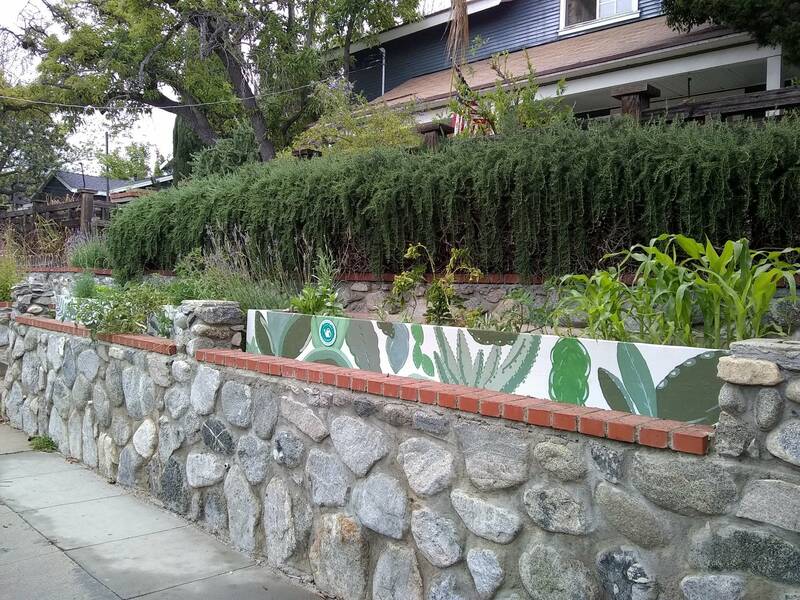 While the gardens in Fargo-Moorhead are still bare, things are growing in Pasadena, Calif., where Tina Renzullo has two garden boxes in her front yard, each 10 feet long. "We still have tomatoes from last year, then I put in strawberries, dill, mint, cilantro. We have corn and I added some flower seeds for people who aren't wanting to take a vegetable out of the garden, they can at least pick a flower in and take that and have that be a bright spot in the day," explained Renzullo. When Renzullo installed Little Free Garden No. 101 last year, it was the first in California. "At first people are like, 'Wait, what? What's a Little Free Garden and what does that mean?'" she said. "You're inviting me to pick food out of your yard, that's a little odd and you know it throws people off at first. "But we've had some really nice conversations, met people who live in the general area that we'd never have met before. So it's been good for us to be outside and engaging with community more and it's also been just really positive to have nice small snippets with people in a day that kind of puts a smile on your face." This year she plans to encourage neighbors to start their own Little Free Gardens by organizing through her neighborhood association. Little Free Garden organizers encourage people to check local zoning laws before putting gardens in the front yard, and they say people who share free produce should be protected from liability by the federal Good Samaritan Food Donation Act, and by similar laws in many states. The somewhat unexpected growth of the idea has Myrdal thinking about the potential. "Now that there's 140 garden owners in 10 states and Canada, it's pretty cool to think about what we can do to connect those folks, how they can be sharing amongst each other," she said. "We have some plans that we're still working on to to connect those folks together and build this community of people."